Why are you in a Wheelchair? Willow rolled over, pulling the blankets back to her side of the bed. She reached towards Bucky, toward the side of the bed he normally occupied- it was empty. The flash of panic that Willow would have felt at finding Bucky gone several years ago was replaced by the normal early morning feeling of slight confusion. Rolling back to her side, Willow reached out and grabbed the handle of her wheelchair and pulled it towards the bed. Wincing slightly at the flash of pain up her spine, Willow pulled herself out of bed and into her wheelchair. Rolling her wheelchair into the bathroom, Willow brushed her teeth and braided her silver hair. Today she tried a waterfall braid, starting up one on side and cascading down. Then she flicked her left hand, and her telekinesis sent the sheets and comforters neatly folding over the bed. Opening her closet door, Willow pulled on a blue tank top and a tie-dye crochet top. This was what Willow Dariela did in the mornings now. A retired SHIELD agent with telekinetic and telepathic abilities, married to an ex-HYDRA assassin with a metal arm. She&apos;d gone from using a sniper rifle to cross of people on SHIELD&apos;s  hit list to taking time to get dressed in the morning, and making her bed. Since moving to Castine Maine, Willow&apos;s life had been simple. And after a long life of crazy, simple was perfect. Steering her wheelchair into the kitchen, Willow stared out the large window and out into the yard. She could see Bucky bent over a plant. Bucky had developed a particular affinity for gardening after their first year in Castine. Which Willow found endlessly amusing- The Winter Soldier, faithfully watering his tomato plants. Willow thought that maybe the reason Bucky enjoyed growing things so much was because he had spent a large portion of his life killing things. Bucky liked simple things; like gardening, building, carpentry. Things that involved creating things, rather than tearing them down. Sirius, their dog had grown from a tiny black puppy to a massive black dog that looked like a wolf- living up to his Harry Potter inspired namesake. Willow rolled her wheelchair out onto the porch, balancing a small canvas and set of pastels on her lap. It was still fairly early in the morning, the sun only just beginning to burn the mist off of the forest. Bucky glimpsed Willow out of the corner of his eye and straightened up, waving at Willow before kneeling back next to the plants. Propping up her canvas against the railing, Willow began to sketch the landscape. She started with the the garden, sketching rows of vegetables that Bucky had planted. Moving on to the trees, sketching the points as they stabbed up into the sky, and then smearing dark blue pastels in the background for the vague outline of the mountains. Then Willow finally added the most important part of the picture, Bucky, kneeling down next to the plants. She drew him smiling, as he was all the time now. Willow was so focused on the drawing that she didn&apos;t realize Bucky was no longer kneeling beside the garden until he was right behind her. "Good Morning Beautiful." Bucky grinned, and then tapped the tip of Willow&apos;s nose with his hand, smearing dirt down her nose. 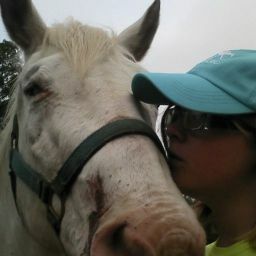 "Willow I believe you have some dirt on your face." Willow reached forward and ran her hand down Bucky&apos;s cheek, leaving lines from the blue and green pastels on her fingers. "Poor Bucky, can&apos;t seem to keep the art off his face." "Real mature ladies. I swear to God, I&apos;m the only normal one here," Lulu&apos;s voice came from just inside the house. Lulu had been staying with Bucky and Willow after being kicked out of her apartment after causing public disruption. "Yeah, normal describes you. In what strange world again?" Willow quipped back. Lulu was still in her pajamas, her hair tangled and her make up still left over from last night. This was in stark contrast to Willow and Bucky&apos;s appearances. Willow&apos;s silver hair was braided neatly and her clothes were rustic and whimsical but in an organized fashion.Willow&apos;s hands were covered in smears from her pastels. 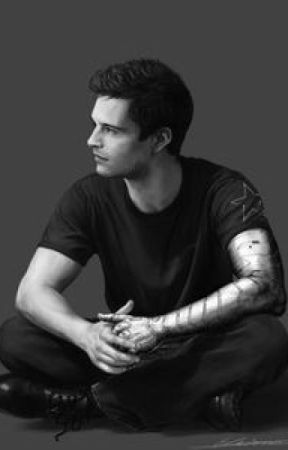 Bucky was wearing jeans and a blue t-shirt, a black fingerless glove covering his metal hand. He was sweaty and his hands were stained with dirt. Lulu stuck her hands on her hips, "Don&apos;t judge me farm boy and art girl." Bucky and Willow grinned at her as she retreated back inside the house. Bucky ran the fingers of his good hand down Willow&apos;s intricate braid, "Nice braid Willy." "Bucky! There&apos;s dirt in my hair now," Willow laughed. "You want to rub some crayon in my hair to make it even?" "It&apos;s not crayon moron, it&apos;s pastel. And yes I think I will," Willow grinned and ruffled her fingers through Bucky&apos;s hair.